Causeway Bay (also called Tung Lo Wan) is another shopping, dinning, entertainment center along with Tsim Sha Tsui. 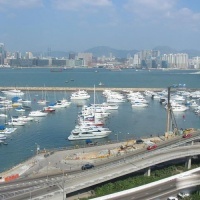 It is the most popular shopping and fashion districts on Hong Kong Island with central location. 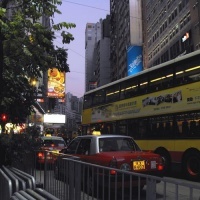 <p The pedestrian crossing at Yee Woo Street is the heart of Causeway Bay, with lots of restaurants, shops, malls, bars, hotels and guest houses of varied sizes. The biggest department stores at Causeway Bay area are Mitsukoshi, Sogo and Lane Crawford, with many brand name clothes, jewelry, watches and electronics available. Or just stroll in smaller Times Square (spot where new year's eve count-down) or Lee Gardens for a drink, eat or just watching movie. Authentic Hong Kong food is popular in Causeway Bay with lots of restaurants along the streets. Many budget eateries featuring local snacks can be found along Jardine's Bazaar, Tang Lung and Matheson streets. The Hong Kong-style tea also worth a taste at some eateries, with many local people gathering. The wide range of international food also attracts many visitors. On the Jaffe Road, Cannon Street and Houston Street, there are many Japanese, Korean, Vietnamese, Indian, Mexican or Spanish style restaurants. After dinner, watching the heart-stop horse racing at Happy Valley Racecourse is a popular way of night entertainment. 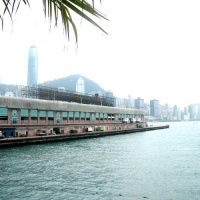 The largest park in Hong Kong – Victoria Park is located at the eastern part of Causeway Bay, providing a large swimming pool, and other entertainment facilities. It is also a great site for enjoying the lantern festival every year and perfect to watch the beautiful moon on Mid-Autumn Festival.